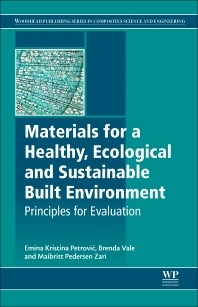 Principles for Evaluating Building Materials in Sustainable Construction: Healthy and Sustainable Materials for the Built Environment provides a comprehensive overview of the issues associated with the selection of materials for sustainable construction, proposing a holistic and integrated approach. The book evaluates the issues involved in choosing materials from an ecosystem services perspective, from the design stage to the impact of materials on the health of building users. The three main sections of the book discuss building materials in relation to ecosystem services, the implications of materials choice at the design stage, and the impact of materials on building users and their health. The final section focuses on specific case studies that illustrate the richness of solutions that existed before the rise of contemporary construction and that are consistent with a sustainable approach to creating built environments. These are followed by modern examples which apply some, if not all, of the principles discussed in the first three sections of the book. Dr Emina Kristina Petrović is a Lecturer in Interior Architecture at the School of Architecture, Victoria University of Wellington, New Zealand, where she completed a PhD in architecture in 2014, and is teaching sustainability and interior architecture. Her research focusses on building materials and their conceptual and practical role in the sustainable built environment with a particular area of expertise in the impacts building materials can have on human health in the indoor environment. Petrović’s work emphasises the importance of informed building material selection for both the built and natural environment, calling for a more detailed consideration of building materials for the totality of their implications (from ecosystem health to ethics of production), asserting the important interrelatedness of these issues. Her other research interests include popular perception of sustainability and history of the 1960s and 1970s interdisciplinary studies of the built environment. Brenda Vale is an architect and Professorial Research Fellow, at the School of Architecture, Victoria University of Wellington, New Zealand. Working with Robert Vale, she wrote her first book on sustainable design in 1975. Following their award winning and energy saving commercial buildings in the UK for which they were both the architects, by 1998 they had designed and built the award winning first autonomous house and the first zero-emissions settlement there. After coming to New Zealand in 1996 they converted an existing house to be zero energy. They also developed the Australian Government’s National Australian Built Environment Rating System (NABERS), now in operation. Their current research is in the field of ecological footprints and behaviour, which has led to two published books (Time to eat the dog? the real guide to sustainable living and Living within a fair share ecological footprint). Maibritt Pedersen Zari is a Senior Lecturer in Sustainable Architecture at the School of Architecture, Victoria University of Wellington, New Zealand. She teaches both undergraduate and graduate programmes in Architecture, Interior Architecture, Building Science and Sustainable Engineering. Her areas of expertise are biomimicry and regenerative design and the practical intersection of ecology and ecosystem services research within urban and architectural design. She has published extensively in these areas as well as on the relationship between climate change, biodiversity loss and the built environment and responses to these issues. Her publications seek to redefine sustainable architecture and urban design through mimicking ecosystems, changing the goals from sustainable to regenerative development, and integrating complex social wellbeing factors into sustainable architectural design.